The Pengelly-Stringer Mk. 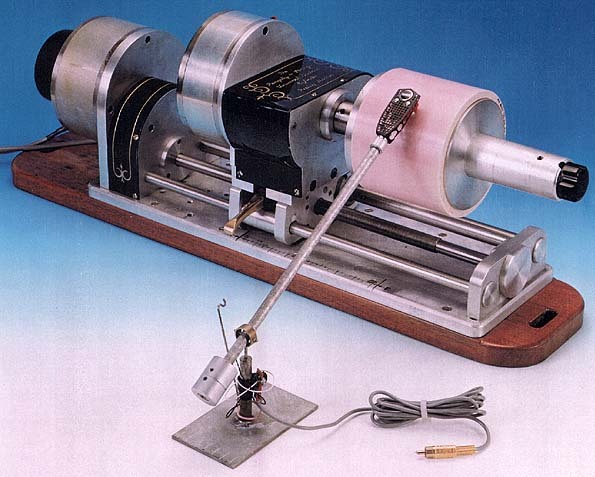 3 phonograph, here with a concert-size Pink Lambert cylinder. Just as today we may think the cylinder a rather unexpected shape to provide with the grooves that preserve sound, so some phonograph makers come up with the unexpected. Joe Pengelly - actually a descendent of a phonograph dealer - has adopted Edison's old moving mandrel design. The player is driven by two independent motors, one for turning the mandrel and the other for advancing the mandrel by a feedscrew much like the feedscrews that advance the reproducer and horn on old phonographs. Both motors are DC printed armature motors with integral tacho generators. Individual servo amplifiers derive the speed of each motor via feedback from the tacho. The speed of both motors is set from a separate box. The mandrel is turned via a 5:1 reduction flat belt pulley train and speed ranges from 0 to 235 rpm. With its shaft and motor it is supported on two slides. The mandrels can be changed by putting any of the larger sizes on the standard mandrel, and Mr. Pengelly has mandrels for all sizes of cylinders. This mandrel assembly is driven along by a feedscrew between the slides. The feedscrew is driven by the motor that is fixed on the left side of the phonograph via a 3:1 reduction flat belt pulley train, and engages with the mandrel assembly via a half nut fixed to the brass handle under the mandrel gear box. Speed of transport ranges from 2.5 to 91 mm per minute. The tone arm is a free-standing pivoted straight arm with a Shure M44C cartridge. This gives the freedom to search out the least worn part of the groove - the early reproducers played at a rather high stylus pressure and caused considerable wear to the cylinders. Mr. Pengelly also claims another advantage to his arm: as the stylus floats freely in the groove, it needs no sidethrust to follow the recording, in contrast to any moving arm, be it pivoted or tangential. Another special is that the mandrel can be reversed to play the cylinder backwards. In this way it should find the more unscathed gradients in the groove. The phonographs are manufactured in collaboration with Mike Stringer of the Mechanical Engineering Dept. of Plymouth University. 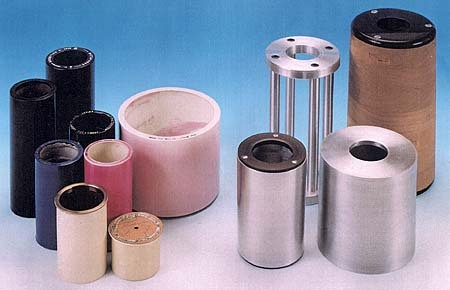 Some of the various types of cylinders and slip-on mandrels for use with the Pengelly-Stringer player.